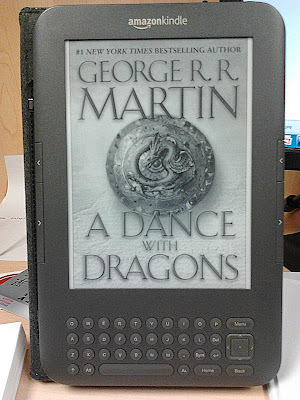 I have waited for this for six years... and it had just been delivered to my Kindle a few minutes ago. I'm sure that many of you are already familiar with the author and his opus, what with the recent success of the HBO series Game of Thrones. I'm also sure that more than few of you who have seen the HBO series have decided to give the books a try, and have already been pleasantly (or unpleasantly) surprised by Martin's continued masterful, savage, and unapologetic treatment of both plot and character. If you haven't seen the TV series nor read the books yet, I suggest that you give either (or better, both) a chance and I promise that you will be immensely rewarded for your time and money. Save that last mention of the word "money," you might have already realized that this post has nothing to do with investments or finance. I think we all could use a break from all that, and what better way to take a break than to spend many a sleepless night dancing with dragons.